I have always been frustrated by the idea of modeling an abnormal human behavior by a normal rodent one and by drawing conclusions from the latter on the former. Particularly, rodents do in the so-called resident-intruder test what they are expected to do and what they regularly do in nature: they drive out intruders from their territory by inflicting harm on them if less damaging maneuvers, e.g., simple threats, proved insufficient. In contrast to rodents, people do not do this on a regular basis; moreover, frequent and regular applications of force seriously raises the question of psychiatric sanity. Nevertheless, the resident-intruder test per se has been used and is still used as model of aggression-related psychopathologies. By working with Menno R. Kruk in Leiden, we by accident discovered that etiological factors of aggression-related psychopathologies lead to weird forms of aggression in rodents, behaviors which were named "pathological" first (1), but re-named "abnormal" thereafter (2). The testing tool is still the resident-intruder test, but instead of counting biting attacks and recording attack latencies we started to monitor more violent forms of attack, including attacks on the vulnerable targets of opponents (head, throat belly), which rarely happen in normal animals but become quite frequent in rodents submitted to etiological factors of human aggression. The repertoire of abnormal behavioral measures widened (3), and the etiological factors studied increased over years (4) which together hold the promise of replicating various aspects of aggression-related psychopathologies; moreover, the psychopathologies themselves (5) with the hope of getting insights into mechanisms that cannot be studied directly in humans. We made a number of efforts to understand the brain mechanisms underlying abnormal manifestations of aggression (6, 7) but "old" techniques have their limitations, for which we recently switched to more novel ones, e.g., optogenetics, and started to investigate direct connections between the highest order behavioral control mechanism, e.g., the prefrontal cortex and hypothalamic executory mechanisms. While such connections may seem weird at present, because current neural models of aggression usually assume that the two brain areas are indirectly connected by means of the amygdala, our recent findings suggest that specialized neuron populations of the prefrontal cortex positively control various normal and abnormal aspects of biting at the level of the hypothalamus. Albeit these findings are at variance with the prefrontal deficit theory of aggression, they are intuitively correct: aggression is risky, and should be "on-line" controlled by a brain area where all information converge, i.e., the prefrontal cortex. After all, the hypothalamus is "blind" and even the amygdala lacks those complexly processed information this brain area is in possession of. Such mechanisms may be a new dimension of prefrontal functions, which may not only prevent involvement in risky behaviors, but may "order": "bite more" or "bite vulnerable" once this involvement had happened. The question arises whether the same prefrontal mechanisms exist in people or not. Is the prefrontal cortex contributing actively to the execution of “abnormal” aggressive behavior? In other words: do executive mechanisms need active contribution from the prefrontal cortex to organize aggression? Intuitively they should, and experimental evidence may support intuition. Human studies in which the impact of actually performed aggression was studied (e.g., subjects played aggressive video games or retaliated aggressively in competitive situations), the prefrontal cortex was activated by aggressive actions (8, 9); moreover, the activation was stronger in subjects with aggression-related psychopathologies (10, 11). If so: how can one reconcile this with the prefrontal deficit theory of aggression? Can an underdeveloped brain area perform better when ongoing activity is to be controlled? 1. Haller J, Van De Schraaf J, Kruk MR. Deviant Forms of Aggression in Glucocorticoid Hyporeactive Rats: A Model for 'Pathological' Aggression? J Neuroendocrinol. 2001; 13: 102-107. 2. Halász J, Liposits Zs, Kruk MR, Haller J. Neural Background of Glucocorticoid Dysfunction-Induced Abnormal Aggression in Rats: Involvement of Fear- and Stress-Related Structures. Eur J. Neurosci. 15: 561-569, 2002. 3. Miczek KA, de Boer SF, Haller J. 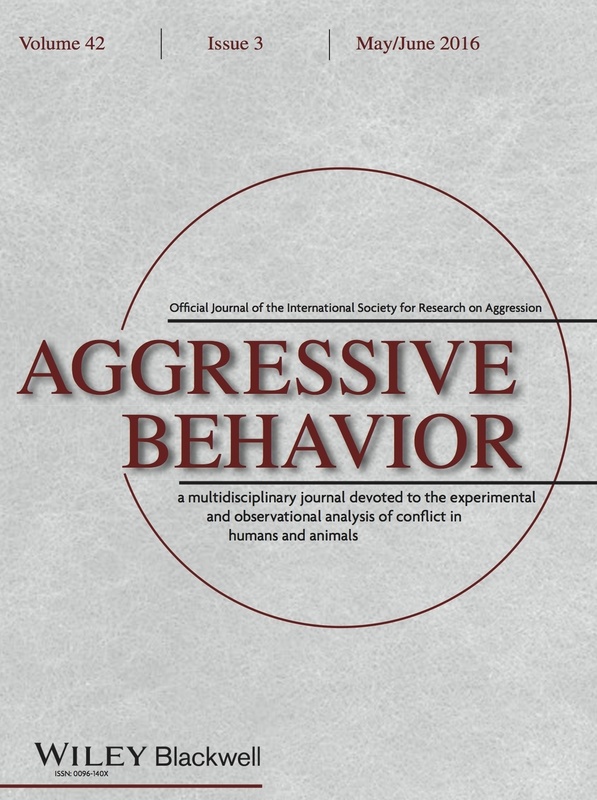 Excessive Aggression as Model of Violence: A Critical Evaluation of Current Preclinical Methods. Psychopharmacology 2013; 226: 445–458. 4. Haller J, Harold G, Sandi C, Neumann ID. Effects of Adverse Early-Life Events on Aggression and Anti-Social Behaviours in Animals and Humans. J Neuroendocrinol. 2014; 26: 724-738. 5. Haller J. Preclinical Models of Conduct Disorder - Principles and Pharmacologic Perspectives. Neurosci Biobehav Rev. 2016 May 26. pii: S0149-7634(16)30005-7. doi: 10.1016/j.neubiorev.2016.05.032. [Epub ahead of print] Review. 6. Tulogdi A, Toth M, Halasz J, Mikics E, Fuzesi T, Haller J. Brain Mechanisms Involved in Predatory Aggression Are Activated in a Laboratory Model of Violent Intra-Specific Aggression. Eur J Neurosci. 2010; 32: 1744–1753. 7. Toth M, Tulogdi A, Biro L, Soros P, Mikics E, Haller J. The Neural Background of Hyper-Emotional Aggression Induced by Post-Weaning Social Isolation. Behav Brain Res. 2012; 233: 120-129. József Haller is the head of the Department of Behavioral Neurobiology at the Institute of Experimental Medicine, Budapest, Hungary, and the head of the Institute Of Behavioral Sciences and Law Enforcement, University of Public Service, Budapest, Hungary. He obtained his Ph.D. in 1995 from the Eotvos Lorand University (Budapest) and the Dr.Sci degree at the Hungarian Academy of Sciences in 2004. His research focuses on the neurobiology of aggression with special reference to abnormal and violent forms of this behavior. His views on the subject were summarized recently in the book entitled The Neurobiological Bases of Abnormal Aggression and Violent Behaviour (Springer, 2014). Dr. Haller recently became interested in studying aggression in a law enforcement setting (see his first study of this kind). He has published over 140 papers in peer-reviewed international journals and been cited over 6,000 times. For a complete list of Dr. Haller’s publications, please see his Google Scholar profile.